Could two famous people possibly look more like two other, unrelated famous people? To me, that’s the highlight of Rush, how much these two lead actors look like their real life counterparts, to the point that it’s unsettling. 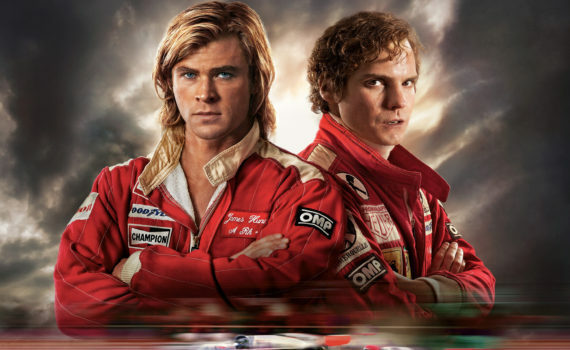 Hemsworth plays the gold boy, James Hunt, Bruhl is Niki Lauda, the cold professional, and the two pull off a film almost completely by relying on their unmatched similarities. Hunt died at a young age of a heart attack, Lauda is still alive today, and I wonder how in depth these two actors studied the true events, the actual people, because they succeeded in nailing the biography aspect of this film. For the rest, Ron Howard cheese is Ron Howard cheese, and you either love it or you don’t. This is the real, larger-than-life story of two racing legends and their epic battle with one another in a sport where each lap is a life-or-death affair. Niki Lauda of Austria and Jame Hunt of Britain were both young drivers starting in the lower levels of Formula 3 but inching their way closer to Formula 1, the races that the whole world watched. In the 70s, and once they both cemented their places with Ferrari and Marboro, respectively, there was no sports rivalry more compelling than that between Lauda & Hunt, a bitter battle that took place on the track, where each point was vital to a championship that always seemed to come down to these two men. But when a terrifying accident derailed a career, would the rivalry ever be resurrected, or would the love of racing die? It really is incredible how much these guys actually look like their characters, especially Bruhl, and they both do a phenomenal job of bringing this historic competition to life. Bruhl, on top of looking like Lauda, is a great actor; I’ve watched him in a dozen movies and it seems like he gets better with every role. Hemsworth is the hunk who plays Thor, which is perfect for this part, but he has the talent to pull it off as well, he’s not just a pretty face. The film itself is a bit sappy and predictable (real events aside), which shouldn’t be surprising given that Howard is the director. He had his successes in the 80s & 90s, won an Oscar for Beautiful Mind in 2001, but hasn’t done great things since, and has always been a filmmaker who relies on older audiences and those who don’t mind a few obvious constructs. That said, Rush is still an enjoyable movie, a great time capsule, I just wouldn’t want to stand it all alone and pick it apart; it wouldn’t stay upright for long.